Fish is a great source of protein and a healthier food option than other meats but these days not all fish is created equal. Unfortunately, due to water pollution and breeding practices, some fish are less safe to eat than others and may be contaminated with mercury, pesticides or industrial run-off. Fish contain high levels of omega 3 fatty acids which benefit the heart and help decrease the risk of heart arrhythmias and help reduce blood pressure, according to the American Heart Association. They recommend eating at least two servings of fish per week. However, the Environmental Protection Agency (EPA) states on its website that almost all fish and shellfish contain some level of mercury, a heavy metal that can be harmful when ingested or inhaled. Salmon is high in healthy fats, protein and is rich in vitamins. It's a versatile, mild fish that's popular with home cooks and professional chefs alike. According to Healthunit.org, wild salmon is a better choice than farmed and less likely to contain high levels of pollutants such as PCBs. Canned salmon is also a healthy choice. It has the same health benefits as fresh and is sustainably caught and economical. Unlike some tuna species, canned light tuna can be eaten safely once a week by older adults and children, according to the Environmental Defense Fund. It comes from the small skipjack tuna and shouldn't contain the high levels of mercury that albacore or yellowfin tuna do. Tuna is a low-fat source of protein and contains heart healthy omega 3 fatty acids. Unlike salmon, it's better to eat farm raised catfish than wild. Because catfish are "bottom feeders," wild ones are more likely to be exposed to pollutants. U.S. farm raised catfish are responsibly farmed, according to an article on Prevention.com, but imported catfish should be avoided entirely. Farmed catfish contains less omega 3s than its wild counterpart but it's still a great source of protein. In addition to being a good source of protein and omega 3 fatty acids, says fitness expert Jillian Michaels' website, canned sardines with the bones contain calcium and selenium. They are also a rare source of vitamin D, a critical vitamin many people are deficient in. Sardines are also low in contaminants. However, a word of warning - sardines are high in sodium so they should be eaten in moderation and you should choose sardines packed in water instead of oil. Wild Alaskan pollock is low in fat and cholesterol and high in protein, minerals and omega fatty acids. The Food and Drug Administration (FDA) recommends pollock as a fish to eat that is low in mercury. In addition, according to Genuine Alaskan Pollock, Alaskan public health officials have set no restrictions on pollock consumption, even for children and pregnant and nursing women. Few things taste better than cooking your own fresh catch, but some local rivers, coastal areas and streams are contaminated. As a result, the EPA recommends checking your local advisories to determine what fish is safe to eat. If no advisories are posted, they advise eating no more than six ounces of locally caught fish per week and no additional fish from any other source. 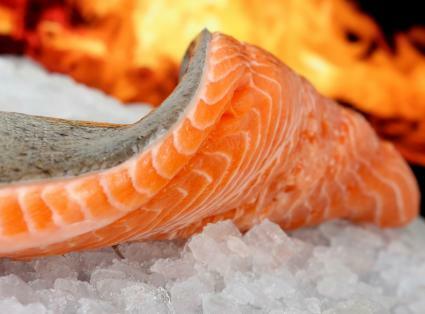 Refrigerate or freeze seafood as soon as possible after buying. Consume refrigerated seafood within two days. Wash your hands before and after handling raw fish. Clean all cutting boards, utensils and counter tops thoroughly during and after preparation of fresh seafood. Thaw frozen seafood in the refrigerator. Cook seafood to an internal temperature of 145 degrees. If you smell an ammonia odor in raw or cooked seafood, do not eat it. All fish contains health benefits to some degree but thanks to pollution, over-fishing and some breeding practices, those benefits don't always outweigh the risks. Seafood safety guidelines and warnings change frequently, especially with imported seafood, so you should regularly check the EPA's fish consumption guidelines. By educating yourself on which fish are safe to eat and which are the most nutritious, you can enjoy the health benefits of eating fish without risk.